Pure Board Shop Just Received Their Spring Shipment of Pure Clothing. Pure's warm weather private label gear has just gone on the shelves. Pure's private label allows us to enjoy a great margin and let our customers purchase great quality clothing at 20-30% off the big brand items. Pure Board Shop has merchandised their Pure line of spring clothing. 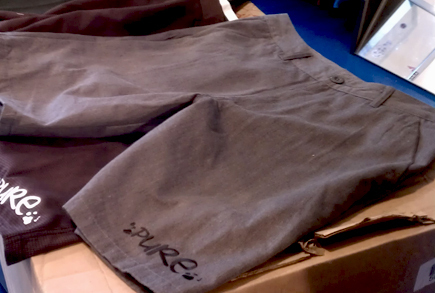 Pure walk shorts, board shorts, tees, zip up knit hoodies and pants are now available. Embrodiered and logo'd all Pure's gear is super clean and easily matched to any accessory item. The shop boasts loads of bright colors from lots of companies for the warm weather seasons fast approaching but the guys went with heathered earth tones for their private label goods. Charcoal, navy blues, cardinals and greens round out the great spring items Pure brought into their mix. Pure has been carrying their own line of clothing for over a decade and with the lower minimums, has expanded their categories over the years. Beginning with obvious tee shirts and hats, Pure now stocks denims and twills, flannels and lined flannel shirts, walk and board shorts and jackets. Before 2006 it was impossible for the smaller specialty skate shop to stock much more than shop branded tees, hats and hoodies. But with a few aggressive wholesalers adding orders from shops across the country to meet the manufacturing minimums, it is now possible for shops like Pure to achieve some vertical margins. Along with Pure's private label new gear new shoes from Nike SB, Adidas Skateboarding, HUF, DC, Vans and Globe. New longboard decks from Bustin,Landyachtz, Original, Never Summer, Sector Nine, Rayne and Loaded.